I’ve recently discovered a new term, and it describes Helen McClory’s writing perfectly: mythic realism. Aptly titled On the Edges of Vision, this collection offers a precipitous sense of standing on the edge of something, of glimpsing a view of a world just like the one we live in, only with extraordinary neighbours. These creatures are familiar from ancient tales yet fresh on the page, mingling with everyday folk. There’s a hint of warning swimming through the words, a reminder that venturing out after dark isn’t always a good idea, a hint that the things we fear aren’t always the right things – that dread, and death, can rush up from unexpected sources. The stories illustrate moments, centred on characters often at odds with the world in which they sit. Not Bernina, though. She seems so at ease, even when she recognises the stranger, that it’s strangely comforting to read. Most of the tales have a sense of ‘old stories’ about them – it’s like rediscovering ancient superstitions populated by familiar ghosts. McClory, now living in Edinburgh, describes herself as being “born and educated in Scotland”, and grew up on the Isle of Skye. She’s also been resident in Sydney, New York and Alberta, Canada, suggesting a wealth of influences. The timeless and new sit easily together, reminding us that some things never change, that in every era, in every place, someone will be lonely, someone will be misunderstood, and there’s always a possibility they will do something chilling and unexpected in response to that. On the Edges of Vision by Helen McClory is published by Queen’s Ferry Press and is available to buy from Amazon. 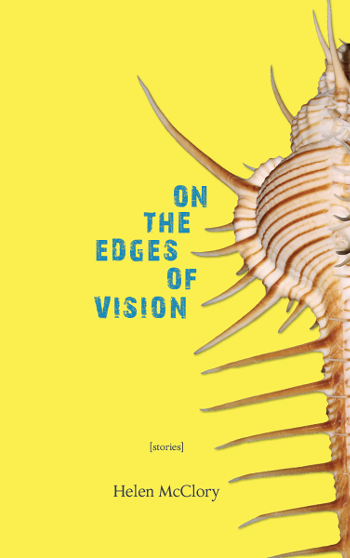 This entry was posted in Reviews and tagged Book reviews, Helen McClory, On the Edges of Vision, short story collections by Judy. Bookmark the permalink.